World Water Day is celebrated on March 22 across the world by the United Nations. It is about tackling the water crisis by addressing the reasons why so many people are being left behind. As sad and unfair as it sounds, today, millions of people have their access denied to life-saving clean water, decent toilets and good hygiene because of where they live, who they are, or how much money they have. The truth is water scarcity isn’t something only people in poorer countries experience and changing your habits will help. Countries with large populations living with physical water scarcity. World’s Water 2019 Report by Water Aid Global. Do you take your access to safe and clean water for granted? WaterAid UK declared that 1 in 9 around the world live without clean water and estimated that at current rates, London, Tokyo and Moscow will struggle with water availability in the coming years. In the latest report by WaterAid Global, it is explained that about 4 billion people in the world live in physically water-scarce areas and 844 million don’t have access to clean water close to home. Our consumer choices impact the world’s water supplies, and with the current crisis and the reality of climate change, is time to take action! -A large population around the globe is facing high water stress. -Lack of access to safe water causes a staggering number of deaths every year. This year’s theme for World Water Day is Water For All, which means every person should have access to clean water as it is their basic human right. Artist Sudarsan Pattnaik spread the message of ‘Save Water, Safe Life’ through his sand art. The sand sculpture showcases the unfortunate plight of a child who is struggling to get a few drops of water. You could take part in activities like the promotion of clean water conservation in your community, at work or school. You could also donate or volunteer with organisations like WaterAid UK who are transforming the lives of millions of people by providing access to clean water, decent toilets and good hygiene. Hold or attend an event to make personal connections that could help people living without safe water. One of the best ways to get the process of saving water started is by taking a pledge of reusing water whenever and wherever possible. Another way in which you can prevent the ongoing water crisis is by preventing water wastage from running taps. The European Commission has been working on high-quality standards for Drinking Water for more than 30 years. Now they are taking another step forward with new rules to guarantee the right to access safe drinking water for all Europeans. If you have a proposal or want your initiatives to be heard, you have until March 29 to have your say. And if you would like to understand more about how ballooning customer demands jeopardise water access for the poorest and most marginalised people. 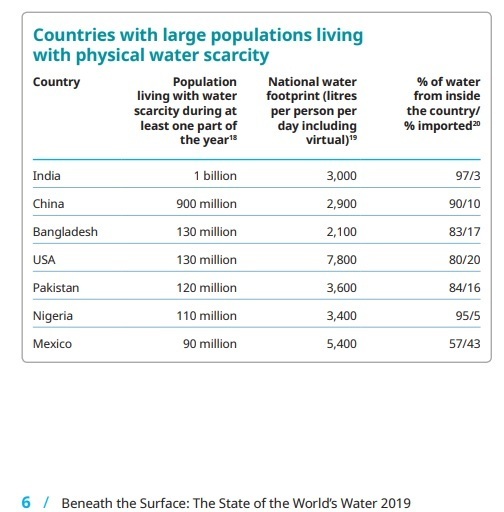 If you would like to know how making thoughtful choices as consumers can help ensure access to water for basic needs, then check out the Report: Beneath the Surface: The State of the World’s Water 2019. 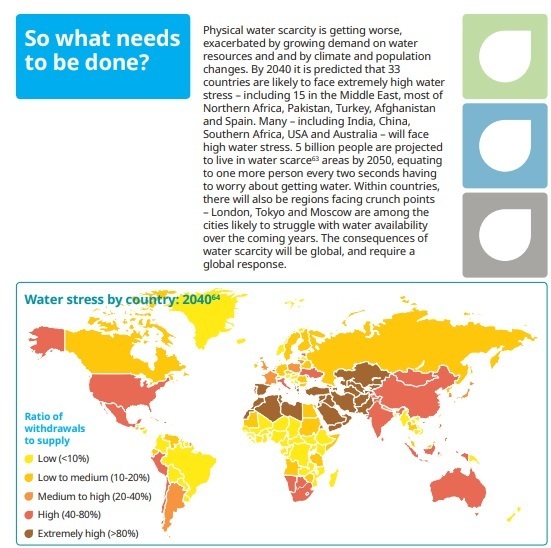 Water stress by country: 2040. World’s Water 2019 Report by Water Aid Global.